Starting today and once every month, I’ll be re-posting from the old blog all the Knitstrology posts. This one was originally posted on January 10, 2012. 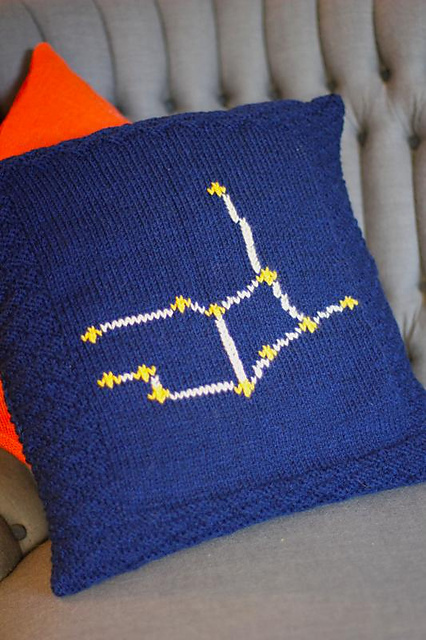 Want to knit your own personalized astrology sign pillow? Check out my “What’s Your Sign?” pattern! I’m far from being an expert on anything (except perhaps the dietary inclinations of yellow songbirds and which specialty cheese would best match your current mood), but I’ve decided it might be great kicks to manufacture some amusing knitting-personalities based on the sketches astrology provides. Disclaimer: I don’t believe in astrology. Full Disclosure: I LOVED astrology in high school. Thought it was the bee’s knees and so forth. So, I’m familiar with the proclivities and fatal traits associated with each sign. So, for your amusement and reading pleasure, I’ll be posting these sketches every other day til they’re all up. 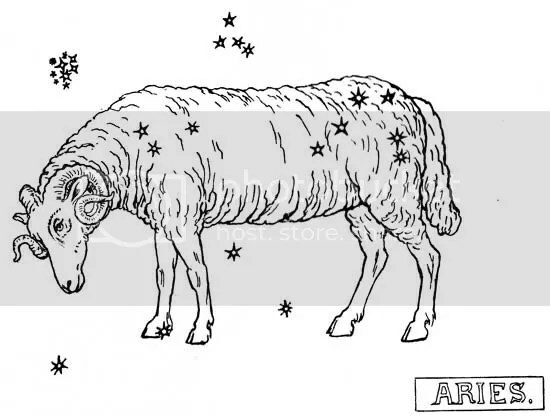 First, I’ll start where the astrological wheel starts: Aries. You have a ram as your sun sign counterpart; talk about serendipitous! Your courageous and optimistic nature leads you to gallop headlong into new projects and challenges. Good for you! It’s wonderful to expand your knowledge base and take on new skills. The downfall here is when that new challenge is proving to be more trouble than its worth; across the room it flies! Impatience and a short temper can adversely affect the outcome of these brave new endeavours. Take heart, though! You might have faults, but you have plenty of positive traits as well! Your generosity leads you to be something of a gift-knitter, one of those whom put their knitting time on the line to give to others. Your enthusiasm for your knitting brings excitement to those other knitters in your group who may be of a more subdued nature. And speaking of that knitting group; your natural confidence and leadership skill make your absence from the regular meetings very much missed, but don’t feel bad about your independent nature leading you to seek more “alone time” knitting. While you might not be the best person to teach someone else to knit (patience isn’t one of your virtues!) you’re great with advice; your frank, direct and candid countenance will stop someone from buying that horrid yarn you know they’ll regret later. Your recommendations on good patterns for taste and skill level will be much appreciated! Aries rules the head and face: knit hats for yourself and other Aries in your life. Red is your colour; if you’re stuck and don’t know what colour yarn to buy for an Aries, a beautiful fiery red is the answer. Try to start your projects on Tuesday; it’s your lucky day of the week. ← #KnitPetiteProject: Sharing your accomplishments! Just lovely! Looking forward to my starsign!